The Series 7 Vaporiser produces masses of vapour and has 2 convenient, easy to use replaceable drop-in cartridge options and great battery capacity. E liquid and Loose Leaf cartridges are included in the kit. As well as being great for vaping e-liquid the Pro 7 also features one of the industry's fastest heat up times for the loose leaf cartridges. 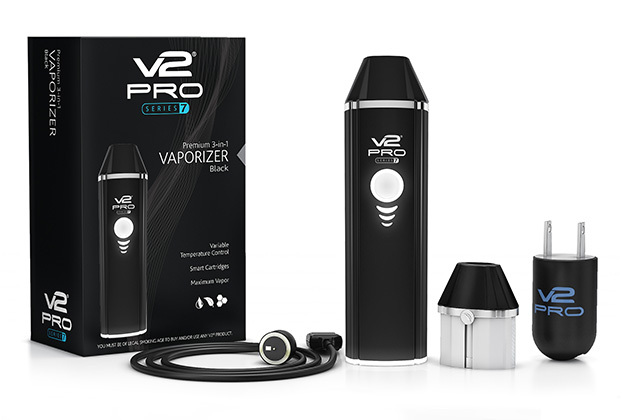 The V2 Cigs Pro 7 gets great reviews and is simply the best tobacco vaporizer and dry herb vaporizer out there. It also loves e liquid. A multi function portable vaporizer with maximum power and capacity, the Series 7 offers a custom experience with variable temperature and voltage settings. The V2 PRO S7 vaporizer kit includes everything you need to start enjoying Series 7, plus a few extras. Each Series 7 vaporizer is equipped with the smart technology and premium features that define Series 3 with important extra features like variable voltage and temperature settings (200°C/390°F, 210°C/415°F and 225°C/440°F). These advanced features combined with larger cartridge capacities and extended battery life make Series 7 the ultimate 3-in-1 portable vaporizer for both e liquid, tobacco and dry herb. Like the Series 3 vape pen, the Series 7 Vaporizer offers compatible cartridges for two, unique mediums: loose leaf tobacco and e-liquid. Once you’ve filled your chosen cartridge with your preferred medium and inserted it into the cartridge chamber, you can select your voltage or temperature setting. If you’re not sure which setting you prefer, the smart technology of Series 7 will recognise the cartridge type and automatically heat to optimum vaporizing temperature. To use your S7 portable vaporizer, unpack the components, connect the magnetic charging cord to your device and plug into a compatible USB port or the wall adapter to fully charge it. The Series 7 Vaporizer is available in a choice of three colours: Black, Steel and Blue. Additional loose leaf and e-liquid cartridges are available for separate purchase when you need to replace your existing cartridges. The V2 Pro Series 7 Kit offers unrivalled performance combined with incredible value. One device for all your vaping needs. Which is the Best E Liquid to use with my S7 Vaporizer? V2 E Liquid is batch tested for high quality, purity & great taste and is the best e-liquid to use with your V2 PRO S7. A USA plug is shown in this image, please select a UK or EU Wall Adapter above. 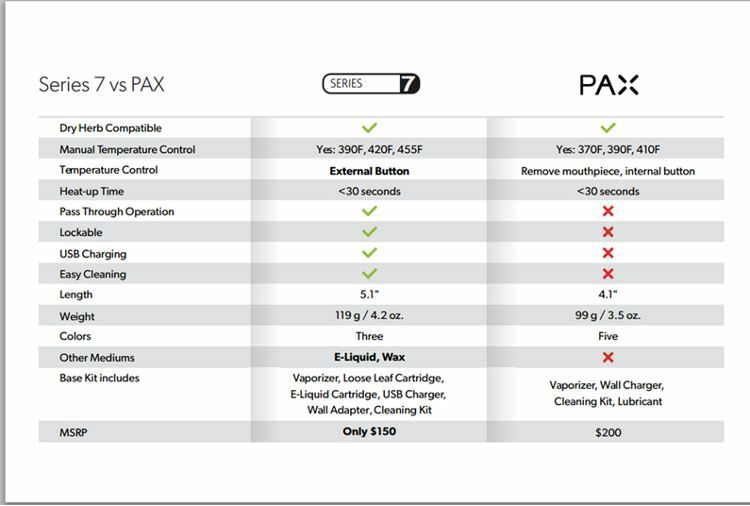 The V2 PRO S7 versus the Pax Vaporizer. I love my series 7....I use all three types of vape medium but on a daily basis I use the eliquid one the most. I appreciate that this model of vape isn't designed to produce huge clouds of exhaled vapour or achieve the results you get with a sub ohm atomiser, BUT, it would definitely get that extra star rating from me if the airflow through the device was little more open. Like I said, I don't want to bellow clouds but I would prefer to direct vape as opposed to the tight draw you get from it. Thinking forward for future designs, a variable airflow feature on this type of cartridge would be nothing short of a godsend in my humble opinion. But all in all I still love my series 7, mainly because I can vape dry herbs and oil/wax without needing to own separate devices. Please please please consider improving the airflow of the eliquid cartridges! Response from Team Vapour2: Thank you for your feedback. we are always very interested in what our customers have to say and their ideas for product improvement. We will pass this info on to our manufacturers. I am very happy with this purchase. I was transitioning from being a 20 a day man, and although other vapes claimed to be superior in this regard, the V7 got the job done, nice n easy and with a satisfying draw. I have not wanted a cigarette since I took my first hit of the platinum liquid which I highly reccomend. My V7 came without a wall charger. I contacted the company by phone and next day the charger arrived recorded delivery. Brought as a gift & the recipient is over the moon with it. He'd previously had a Pro Series 3 Vape Pen & was really impressed with that, but needed an upgrade & I thought the V7 Pro sounded like a good choice. I have a V2 Shisha Pen which I'm happy with too. Really glad I chose this. A great little gadget, looks good, nicely made. Excellent service & highly recommended. I received my kit last week, and while the vape tank and device were fine, the loose leaf chamber broke after a couple of days - however, the company were very quick to rectify this and sent a replacement in a matter of days (it works fantastically well, by the way). Very happy with the product and the customer service I received! Excellent value for money product, excellent customer service!!! Genuinely impressed!! I use this vape pen for herb. I smokes nice funky taste from vaping not burning but a better high indeed. Dont even use alot of greenery in the vape pen its self. having used this product for over a year now and not smoked a cigarette since this product does help you to stop smoking however the oil refill cartridges are expensive and the plastic they use is very ... very very poorly made so they break extremely easily making you order a new one every month or so. (still cheaper than fags but that bit is a rip off) They could make their oil refills and the silly plastic bit on top from a lot stronger plastic or even at least give you two plastic mouthpieces with every oil container then when the flimsy plastic clips snap which they will and always do you would have a spare for the life of the oil container. I now myself have sat on my desk 4 oil containers and two broken but slightly usable plastic mouthpieces and the oil container and mouthpiece i am currently using which again is broken. which means you don't get a full suction from the oil container every time so basically 5 oil copntainers all of which are fine and no mouthpieces to get a good puff!! V2 sort yourselves out its a simple job to use a plastic that doesnt break when you unscrew it to fill up your tanks or failing that sell the plastic mouthpieces separately!! other than that people reading this review its a good product to stop the fags and settle for something (supposedly ATM) more healthy!! Response From Team V2: We are aware that this is an issue and are working with the manufacturers to remedy this situation. We do offer replacements so please call us to arrange for them.